The historic Tiverton Estate is revitalized and renewed. Dr. Frederick Owsley, originally of Chicago, had already established Tiverton in Greenwood, Virginia, estate as a large dairy operation prior to undertaking the construction of his manor house. 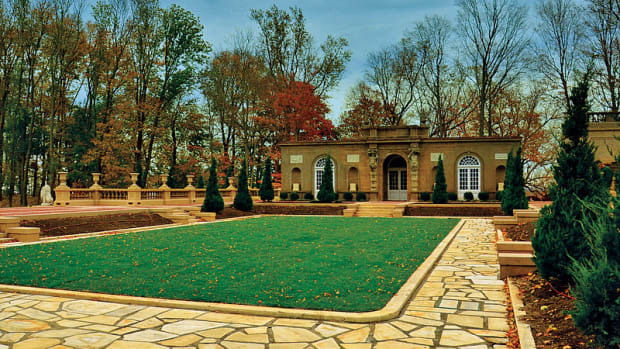 He chose to build a large home in the Classical Revival style. 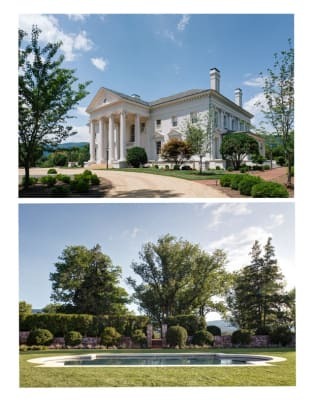 The original architect is not known, but as of some skill, and had knowledge of the White House’s design, of which Tiverton’s resemblance is patterned. Dr. Owsley’s third wife and widow, Mariska Golgotzen, the Baroness Von Eltz of Vienna, Austria, survived a devastating fire that gutted the structure in 1935. 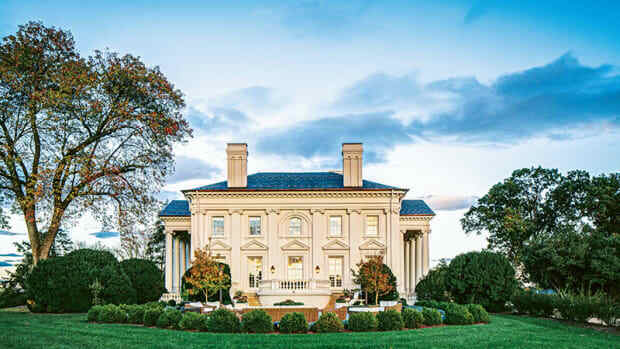 She hired Richmond, Virginia, architect Carl M. Linder to rebuild the house. At this time she also employed landscape architect Charles F. Gillette, of Richmond, to redesign the grounds and gardens. 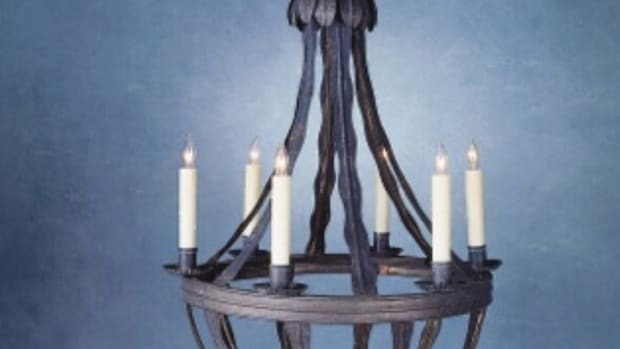 Mrs. Owsley rebuilt her home to be more fire proof than its predecessor. The exterior and interior loadbearing are the same brick construction left standing after the fire. The floor system though was replaced with poured concrete slab on steel bar-joists, with suspended plaster ceiling and wood floors on wood sleepers. 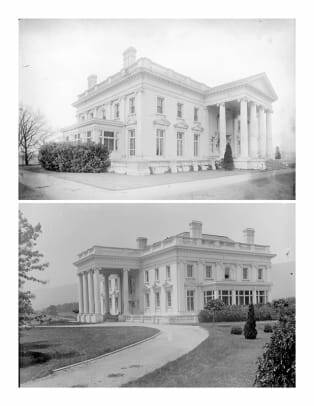 Photographs of the house circa 1912 were found as part of the Holsinger Studio Collection in the Special Collections Library at the University of Virginia. From these images, we can discern the exterior differences between the original design and the rebuilt structure. The most obvious are the elimination of the roof balustrade and southern most pediment addition. The photos of the original gardens hold little resemblance to the latter work of Gillette. Purchased in 1960 by an out of town owner, the house was used sporadically as a summer getaway until falling into almost non-use during the past 25 years and elements and lack of basic maintenance took their toll. The gardens also became consumed by Virginia’s jungle of ivy and weeds. Pools cracked, exterior stucco cracked and failed, drainage systems clogged, and even the spray coated finish, containing asbestos that at some point was touted as a cure-all for cracked stucco began to flake and peel off in sheets. The new homeowner had only see the property from the exterior before purchasing it as his next restoration effort and future home. Working within a historic overlay district and hoping to take advantage of the State of Virginia Tax-Credit program, the charge was clear—rework the house, updating all systems, and find within it, a home for today’s lifestyle. The Trustees of Reservation take on the task of restoring the Crane Estate's Italianate Courtyard to its early 20th-century beauty. 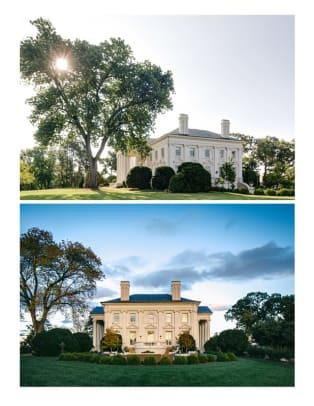 See how a nearly abandoned Virginia estate is given a new life, one defined by tradition, in the Tiverton restoration.